The 10th Massachusetts was raised in 1776 at Boston and assigned the following year to the Northern Department. In October 1777 it was assigned to the main Continental Army. It appears that a Colonel Thomas Marshall was commanding officer from 6 November 1776 until 1 January 1781. Colonel Benjamin Tupper was commanding officer from 1 January 1781 until 1 January 1783. I haven't managed to find out anything else about this regiment. Wikipedia states that it was present at Saratoga and Monmouth, which seems plausible enough. 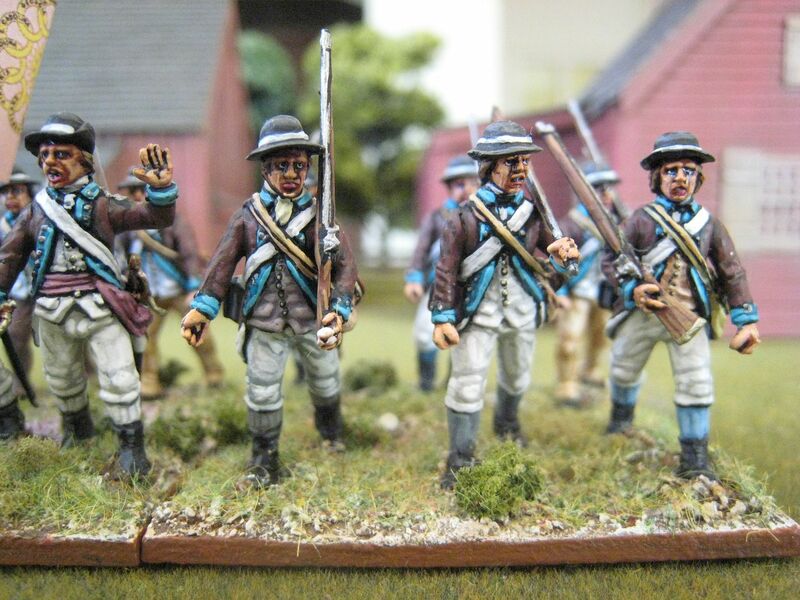 I was inspired by the Don Troiani painting of this regiment, which showed the brown coats with sea-green facings. 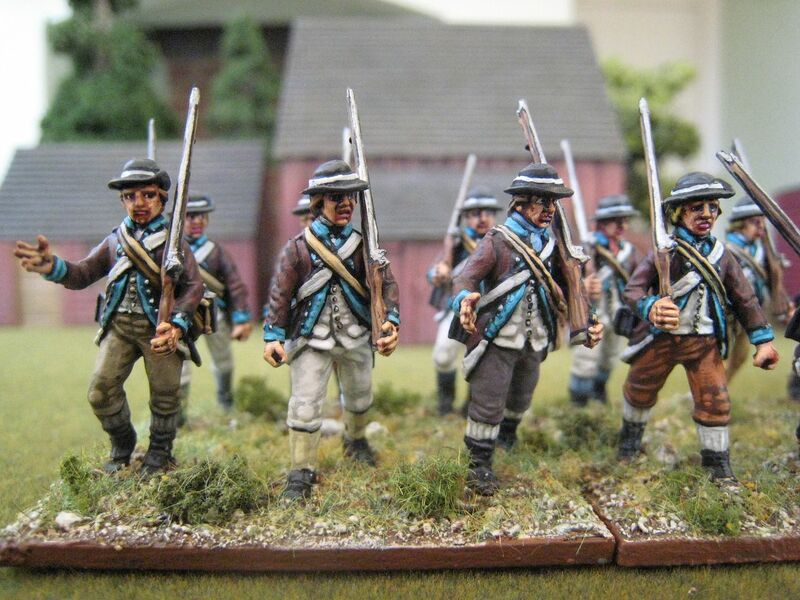 I knew nothing of the regiment but was drawn to the brown faced blue-green facings. 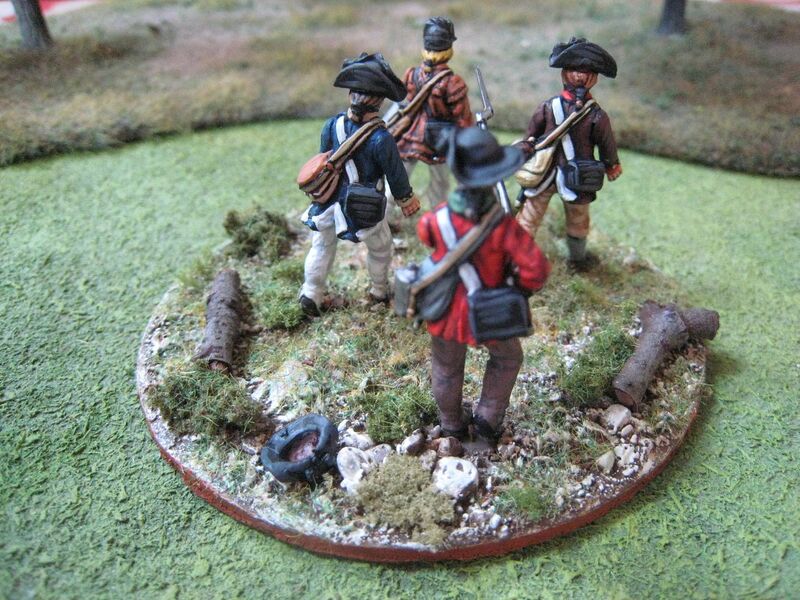 The round hats suggested that this would be a good unit with which to start on my Perry plastic Continental Infantry sets. The facings were painted with Foundry's "Teal Blue 24" palette and the coats with "Bay Brown 42". I wanted to have some variation in the colour of the breeches and stockings. The flag design is taken from an image I found on the internet, attributed to the regiment. I have never seen a flag with this design, but it's different and somehow the pink/peach colour of the flag goes quite well with the green/brown look of the regimental coats. Another point to note is that this is the first unit I've painted and then not varnished. This is largely an experiment - I had noticed that the varnishes I was using dulled the colours and in particular took the edge off the faces. No doubt some readers will think the latter is a good thing, as the unvarnished faces here do look a little shiny, as a result of the brown ink washes I use. I'm not sure I'd leave metals unvarnished, but I think these plastic figures may have benefitted from it. As noted above, I don't have much information on this regiment's battle history and it doesn't appear in any of the published "British Grenadier! "/Caliver scenario books. 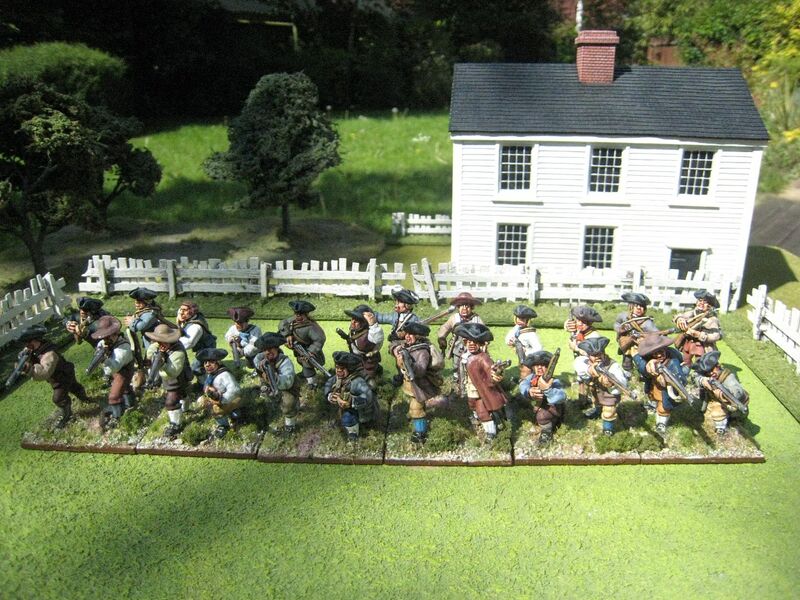 Plenty of Massachusetts regiments do, however, and so I would ensivage uses these figures when something more specific is lacking - for example, the Princeton scenario has two 12-figure units of "combined Massachusetts regiments". I'm surprised to see that it has been 4 years since my last unit of regular American infantry. But these figures were fun to paint and in uniform colour and pose are quite different to anything else I have in my collection. 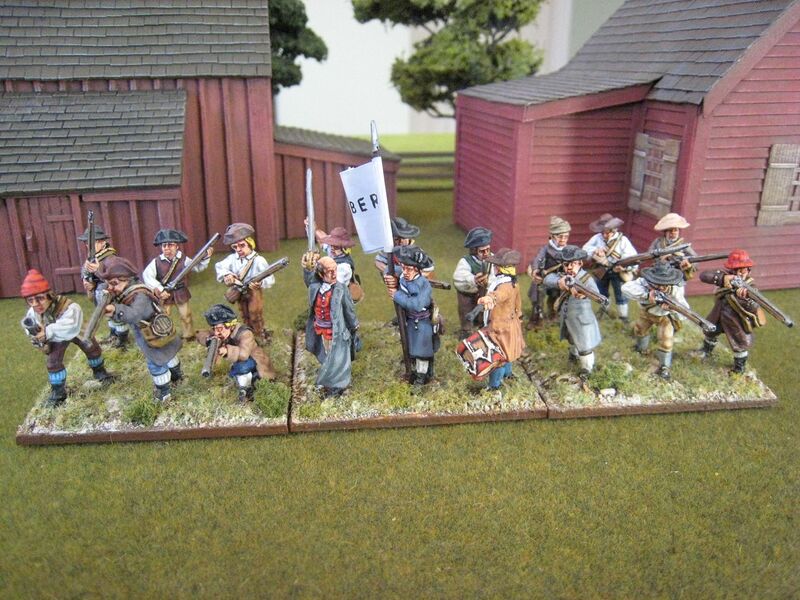 I finished painting the figures in August but then got stuck on the flag for a while until I found the online example. 24 figures. Painted July/August 2014. It's a sign of how far I've fallen behind with things that this unit was painted at the beginning of the year. It remained unfinished because I couldn't find a flag that fitted the standard bearer. The pole is cast on and too small for GMB or inded any other commercial flags that I had. So I needed to paint one up myself and I just never got around to doing so...until last week. 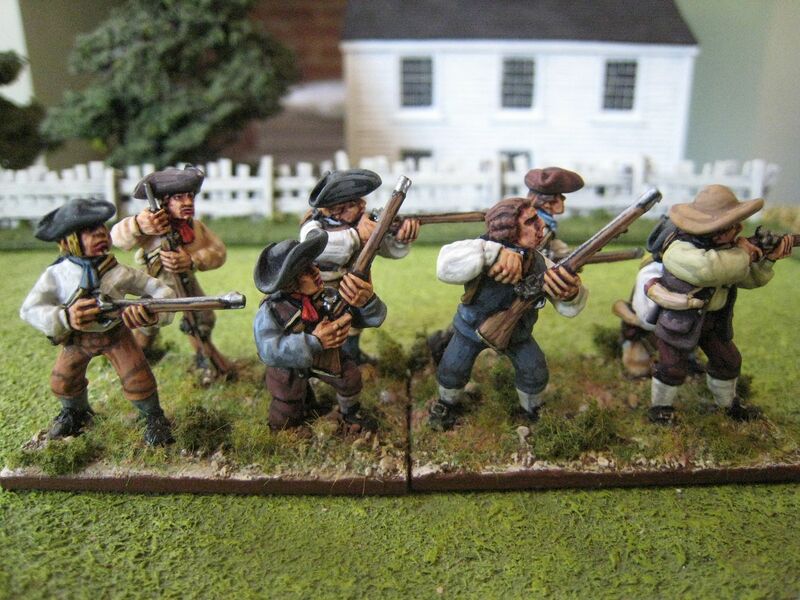 So this unit of American militia stood on my bookcase unfinished for almost a year. 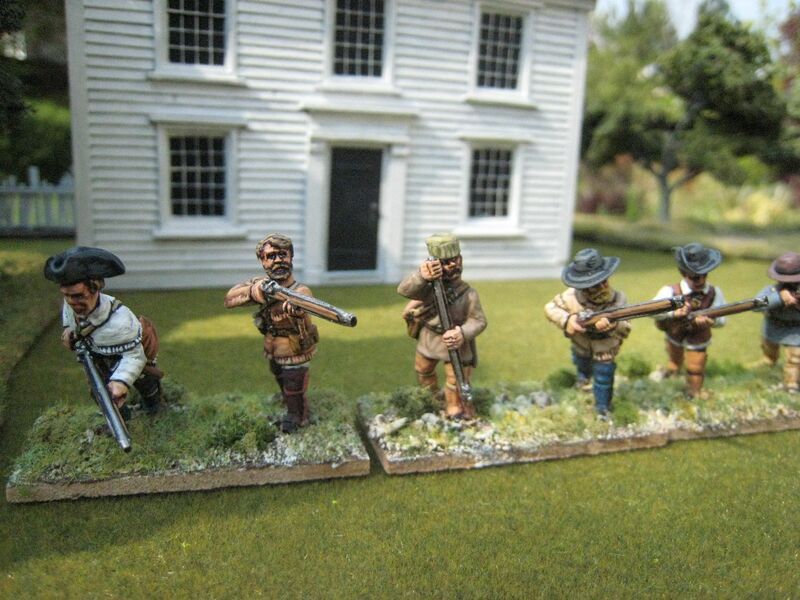 It uses a mix of Foundry and Perry figures, together with one figure from one Conquest Miniatures' "settlers" packs (back row, second from left). 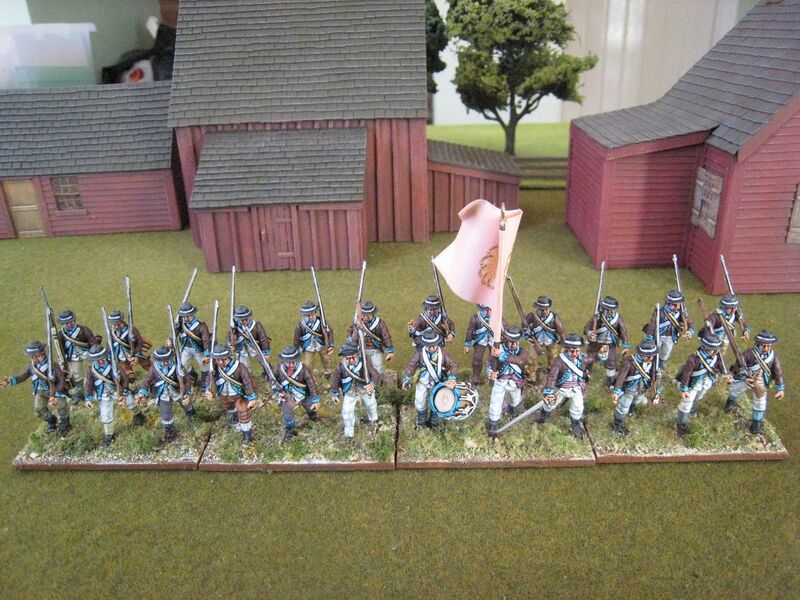 I painted most of the figures years ago (see here) but saved two back as I thought they would fit into larger militia units rather than act as skirmishers. The smaller size of the Conquest figures makes them a good fit for teenagers - I thought of that scene in "The Patriot" where Heath Ledger interrupts a church service to call out the militia and a couple of boys stand up with their fathers. 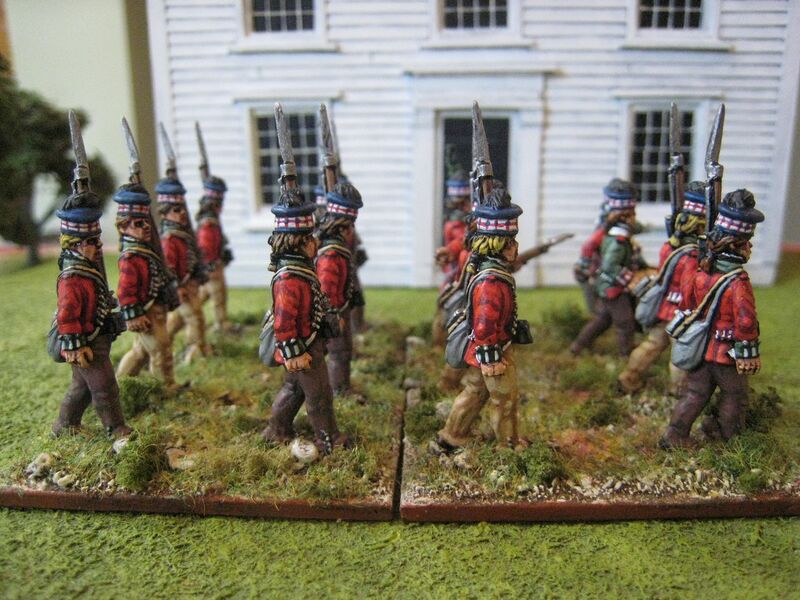 There's also a marching figure that is in another unit I'm just finishing off now. 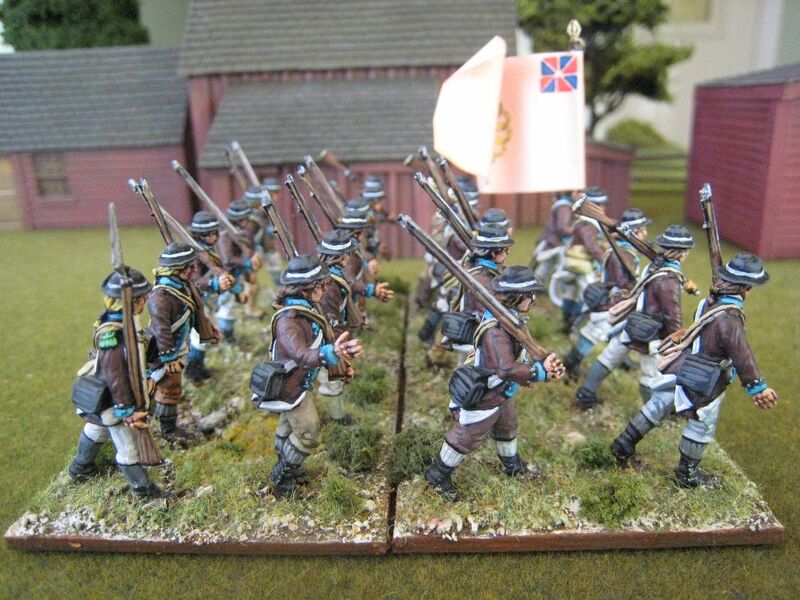 The Perry figures are a mix of "northern" and "southern" packs. I just wanted to use up all my remaining firing militia figures. 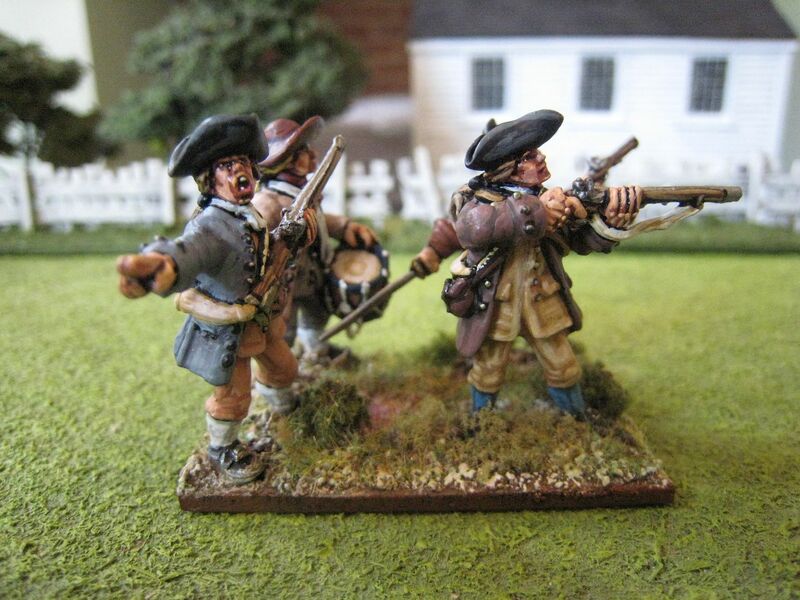 The officer is, I'm pretty sure, modelled on Colonel William Prescott, one of the patriot commanders at Bunker Hill. He is usually depicted in a long overcoat and a floppy hat, brandishing a sword. There's a terrific statue of him at the site of the battle (see here for my reminiscences on visiting Boston). 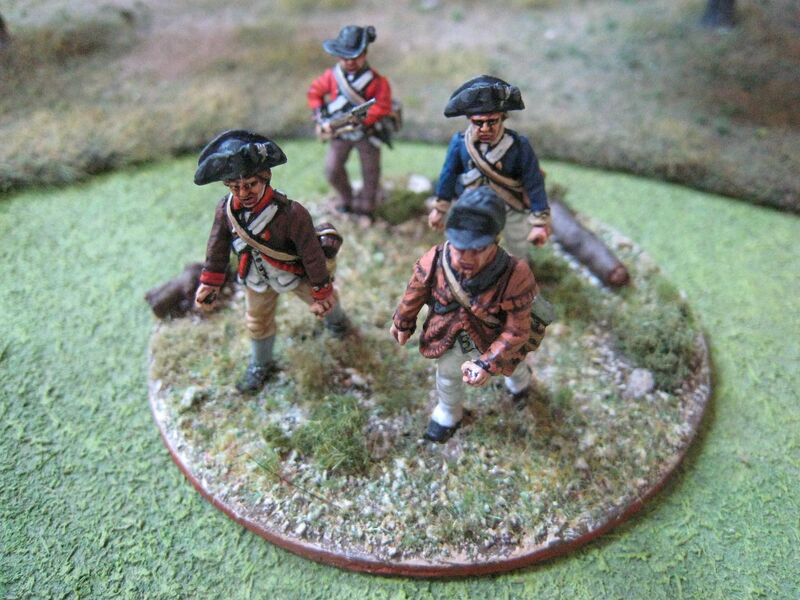 Prescott was 49 at the time of the battle, so may well have been rather thin on top. He is credited with giving the order "don't shoot until you see the white of their eyes". He survived the battle and appears to have then commanded a regiment of the Continental line. 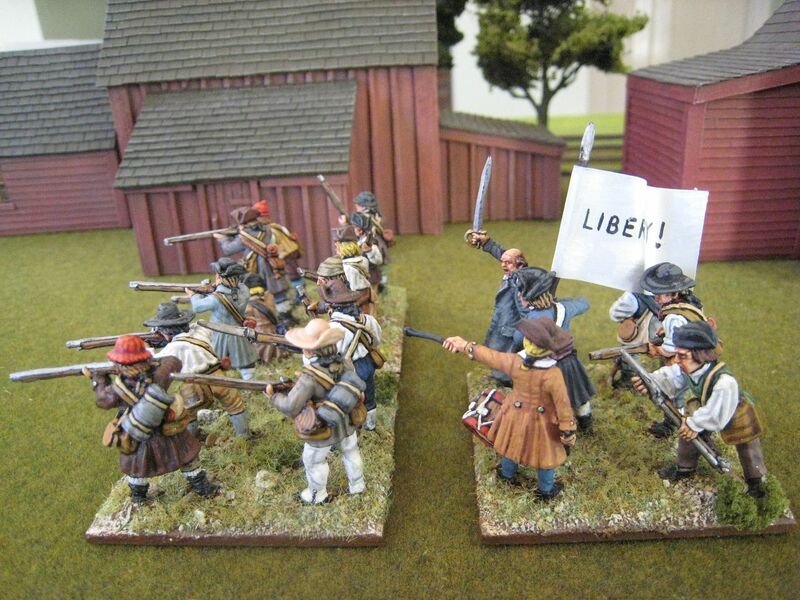 The flag is a very simple hand-painted affair - "LIBERTY!" on a white background. I'm determined to get up to date on this blog by the end of the year. So, and I appreciate I keep saying this, there will be more regular blogs posts over the next few weeks. I certainly have enough material now. 18 figures. Painted January/February 2014. Apologies again - work has completely taken over my life for the past 2 months or so and I just haven't been able to turn my mind to much hobby-related stuff. I also haven't managed to find the time to travel the few miles down the road from my office to see the amazing ceramic poppy installation at the Tower of London. I saw it in July and it looked pretty impressive then. But now it has a poppy for every British and Commonwealth soldier killed in WW1 and it is quite wonderful. 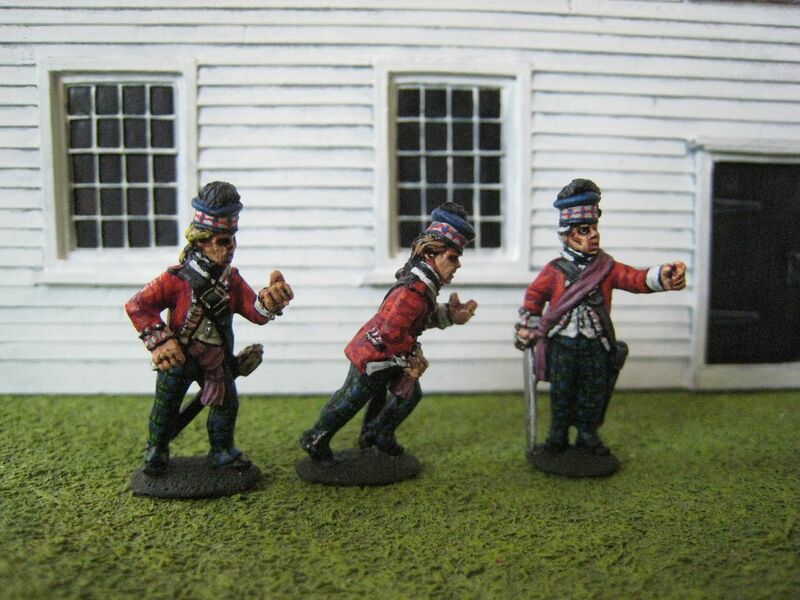 On the painting front I have various things close to being finished: here's a photo of 3 different units that are in varying stages of completion: 2 battalions of Continentals (one of which utilises Perry plastics) and another battalion of 1815 French (Perry plastics again). 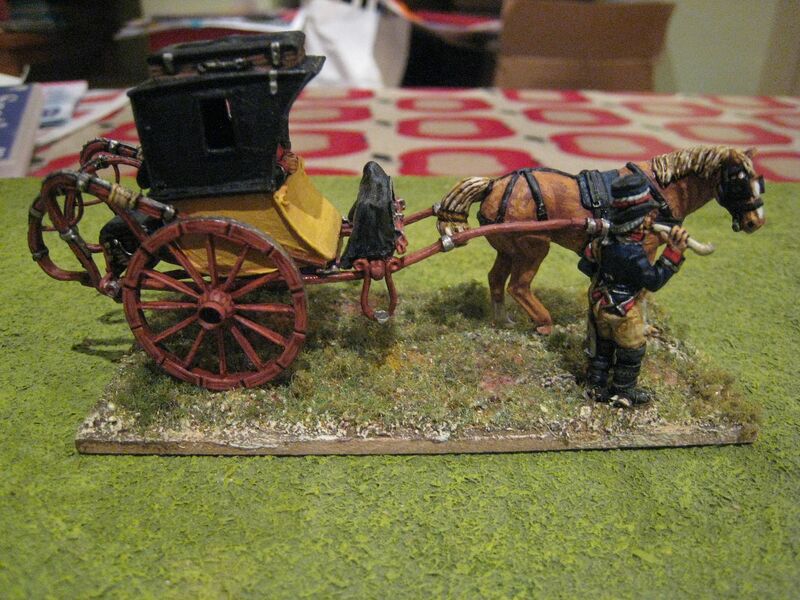 Also on the painting desk are a Napoleonic French post coach, more AWI militia and a "milking time" vignette from Eureka Miniatures. 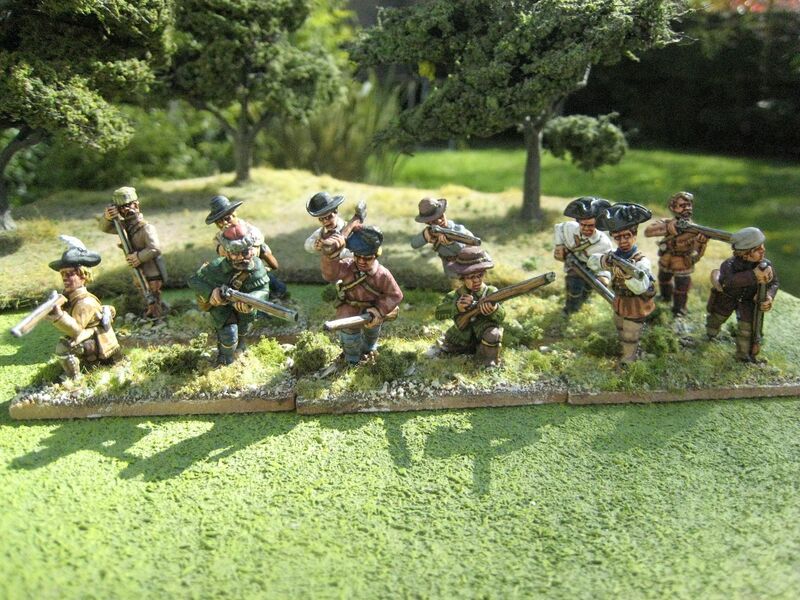 And of course AWI highlanders and mountain men for Bill. Phew! 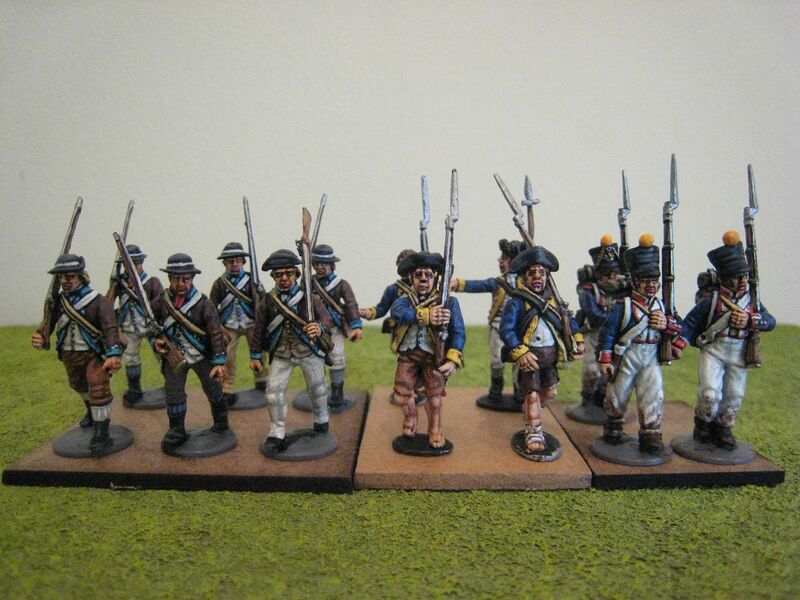 I started on the 1815 French simply because I had a sudden urge to paint some - as I've said many times, I absolutely love these Perry plastic French infantry and I still think that it's the best infantry set that the Perries have produced in plastic (and I've painted 6 of their plastic codes so far). Indeed, I've found painting these figures actually rather therapeutic over the past few weeks. Readers Simon and Simmy asked recently how I'd found the Perry plastic Continentals. 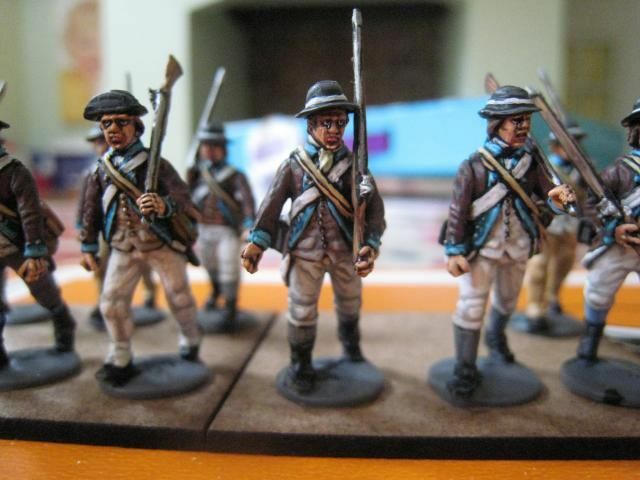 Simon noted some difficulty in putting the figures together and he's right - having to glue the arms on can be a bit tricky and, as noted with the AWI British plastics, removing the hats from the sprues can also cause problems. But I like the figures - naturally posed and excellent facial detail. You can see from the photo how the size/proportions of new Continental plastics are rather different to the French infantry on the right - the former are quite a bit slimmer. Is the chap in the middle another "Alan"...? So the above is a taster of what I've been doing for the past 6 weeks or so, and again I'm sorry that both this blog and my appreciation of other blogs have gone awol again for a while. I will have at least one "proper" post at the weekend, as those photos (of something that's a bit of a departure from my usual stuff) are already in the bag. I then need a bit of sunshine to take some others, including another unit of the 71st Foot and the above Perry plastic Continentals, which I have now finished. 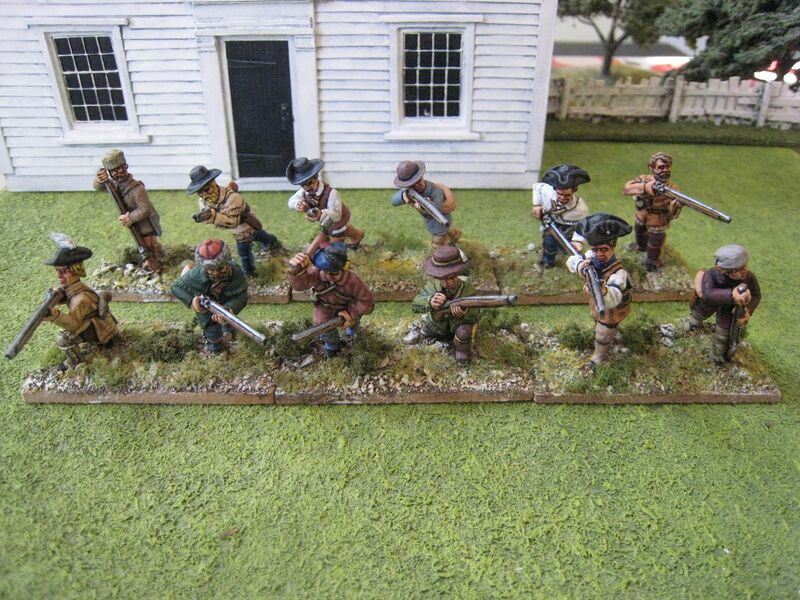 This is a unit of militia that consists of Galloping Major F&IW figures. I first started working on it in June last year, having picked up a couple of packs of "skirmishing settlers" at Salute. GM announced shortly afterwards that they were working on more militia figures so I waited for those to be released to complete the unit. 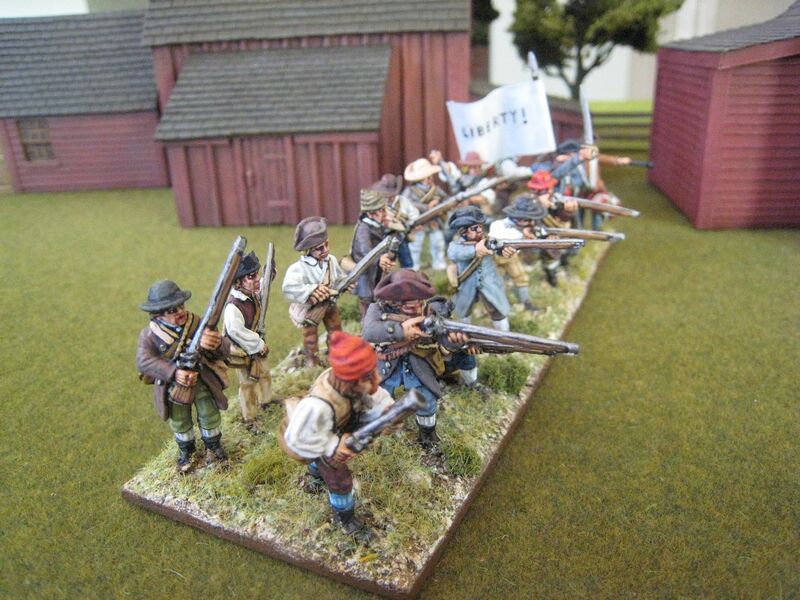 Those figures came out earlier this year and so this unit contains a mix of lightly-armed settler types and more heavily equipped militia. I thik the mix works well, although some might quibble whether you'd find men in shirtsleeves and coats at the same time - it would be either too cold to be in shirtsleeves or too warm to need a coat! The GM packs don't contain a standard bearer figure. 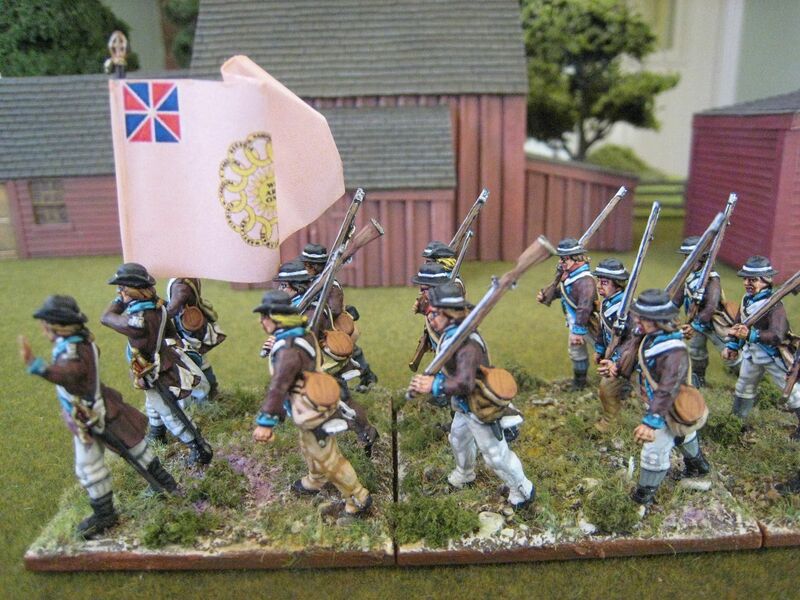 I suppose it might be possible to convert one, but I don't mind and I'm quite happy to have one militia unit that doesn't carry a flag as it can be used as Loyalists or Rebels. 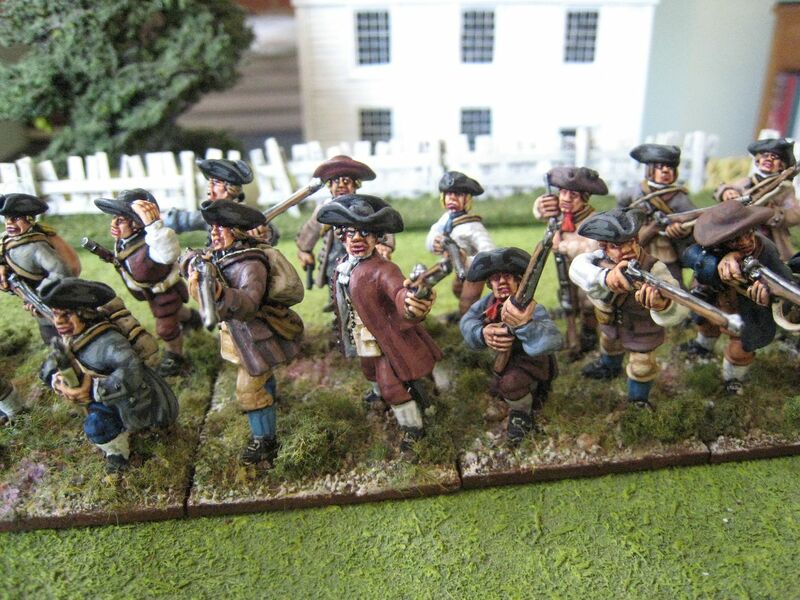 In fact, when painting these figures I had them in mind as being used primarily for Loyalists - rightly or not, the more old-fashioned nature of the clothing (bearing in mind that these figures are designed for used in the 1750s) suggested to me men of a more conservative nature. I also had an eye on the Savannah scenario, which I've been working at on-and-off over the past couple of years - this requires a 20-figure unit of Tory militia. 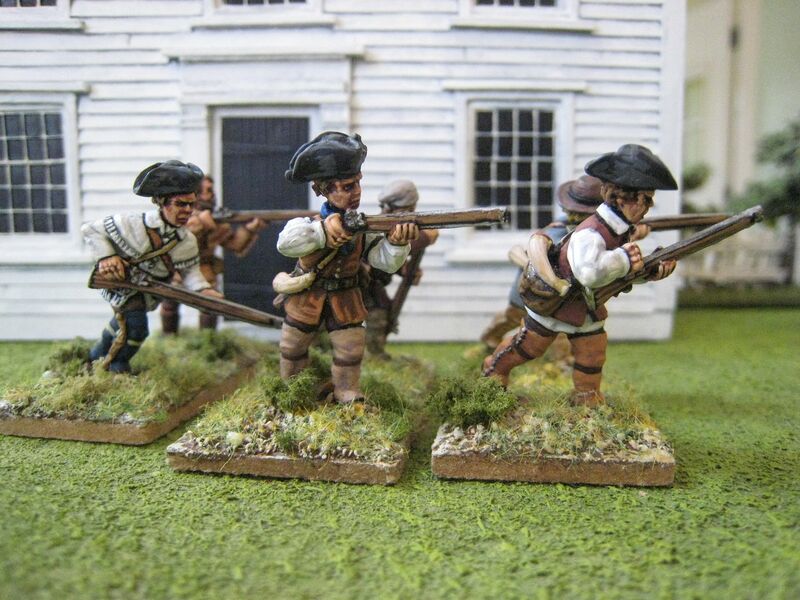 Other scenarios which feature units of loyalist militia are Camden (20 figures) and Hobkirk's Hill (16 figures). The poses of some figures would be good for smirmishers. If I'd started work on this unit once all the figures had been released I'd probably have saved some of the kneeling and running figures back and put those on some special skirmish bases. Perhaps I should have reversed the chap who is holding onto his hat and running so that it looked like he'd lost his bottle and was making a run for it. 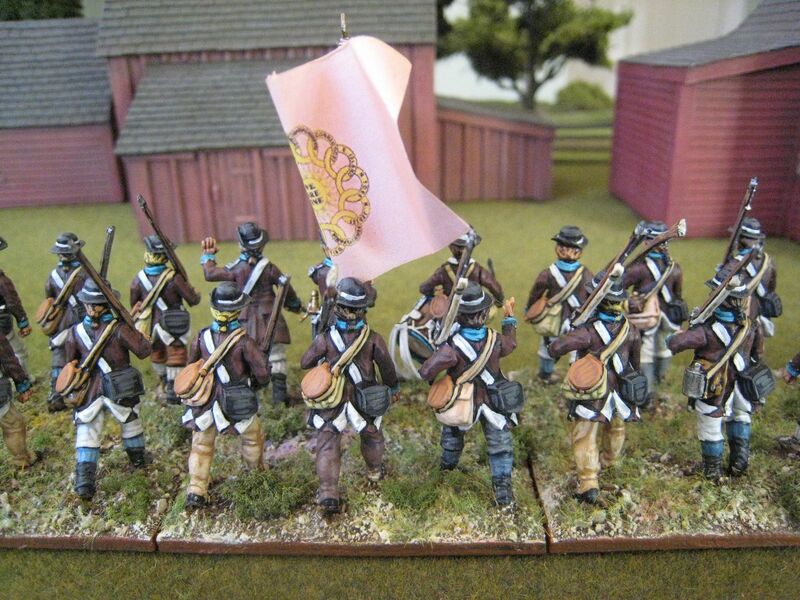 There is no standard bearer in the command packs, but that's not a problem unless you feel you really must have a standard in every unit - most militia didn't carry standard or flags, I suspect. 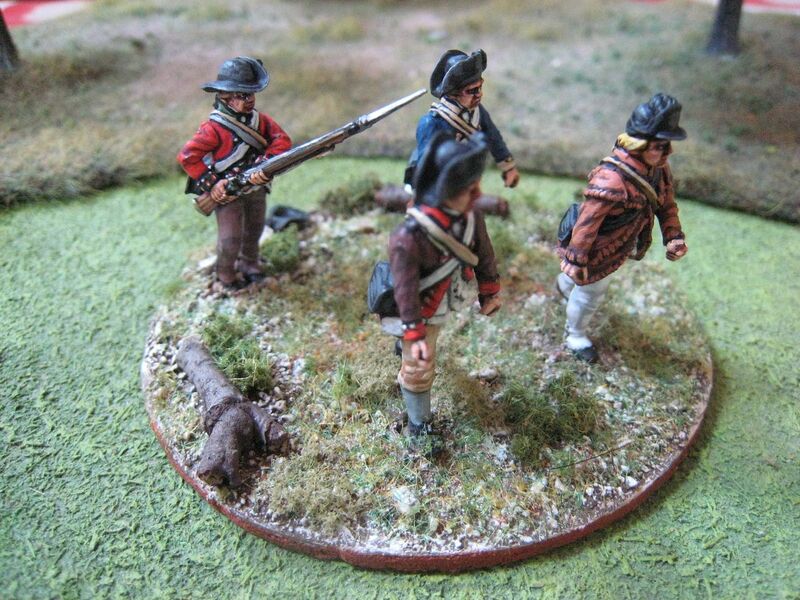 The figures are on the large side of 25/28mm. Being F&IW figures their reference point in terms of size is more Redoubt Miniatures than Conquest; the latter would look rather puny in comparison. 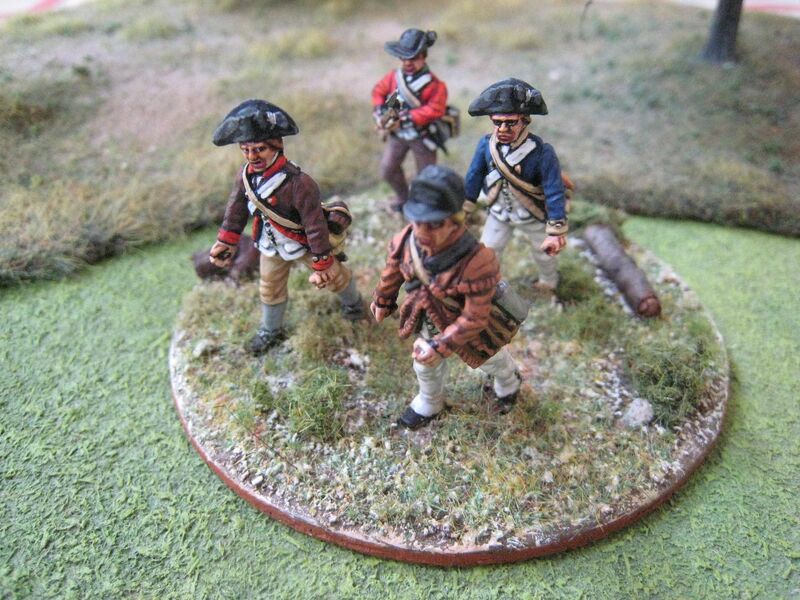 So I'd suggest keeping these figures in their own units and not mix them with other standard AWI ranges. 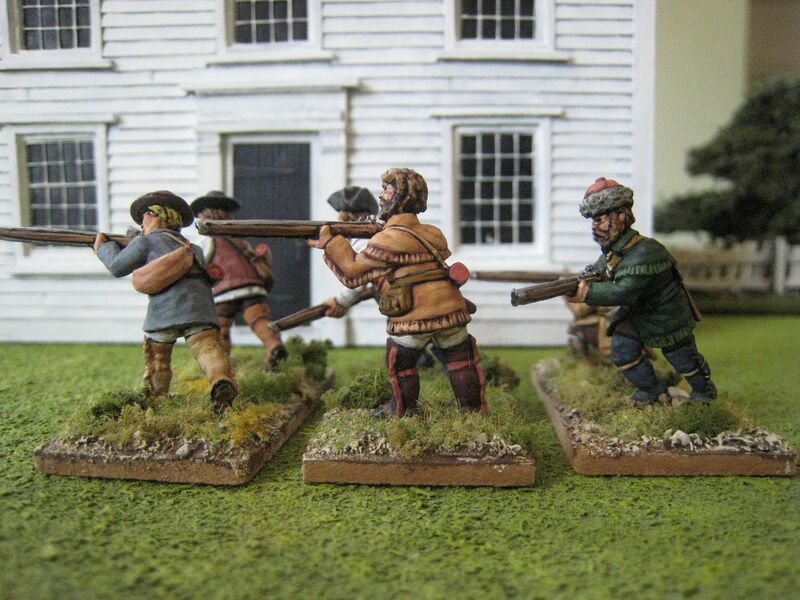 They are, however, a very good fit for the new(ish) King's Mountain Miniatures over mountain men, which Bill Nevins tells me were designed with more than one eye on the F&IW. 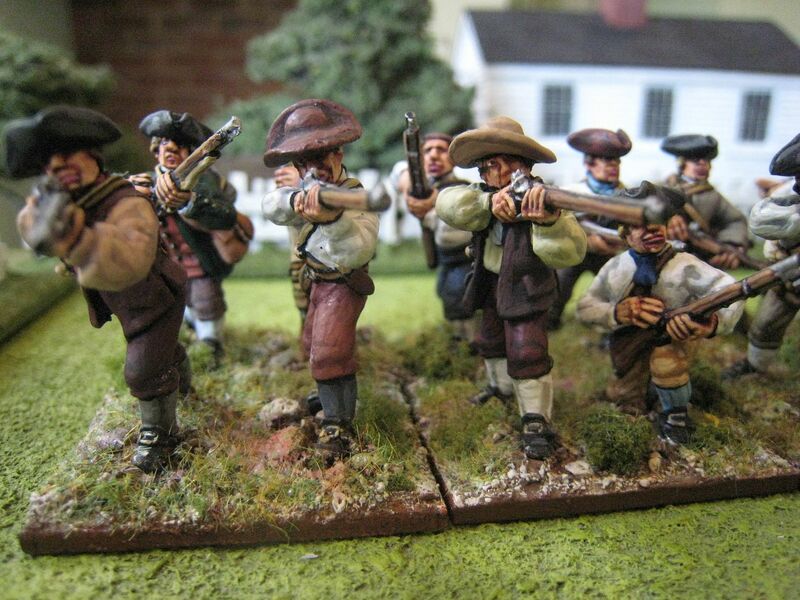 The figures are easy to paint - the surface detail is crisp and accessible and the various straps are clearly set out. 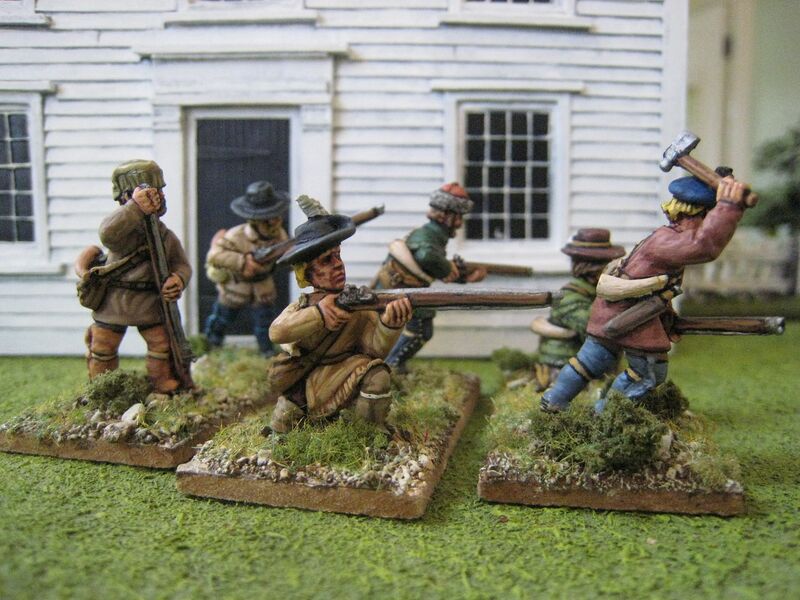 You can't have too many militiamen for the AIW, so I recommend these figures, which come from a mixture of "settlers" and "un-uniformed militia" packs. 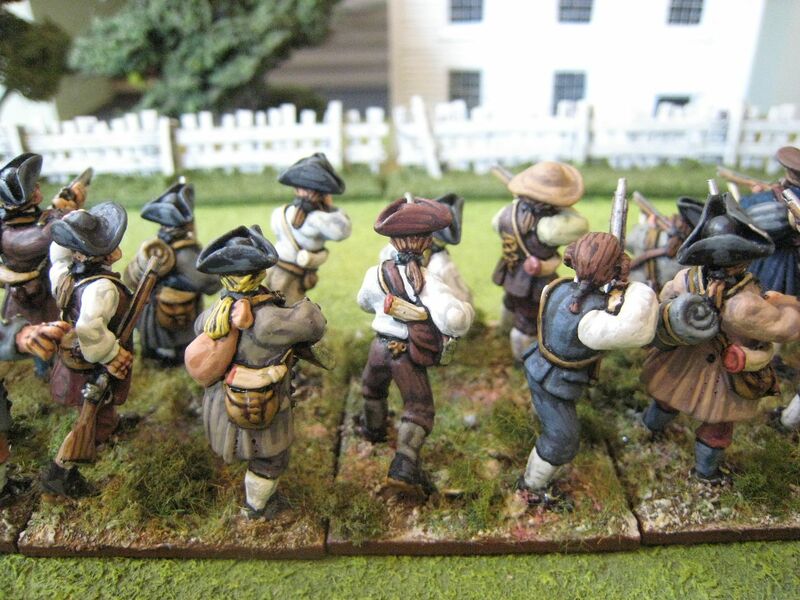 Galloping Major have some sailors n the pipeline which will also be very useful for the AWI - the Savannah scenario, for example, requires a unit of 8 sailors. So it's worth putting this company on your AWI radar. 24 figures. Painted June 2013-June 2014. Just a quick post while I work up a couple of longer ones. 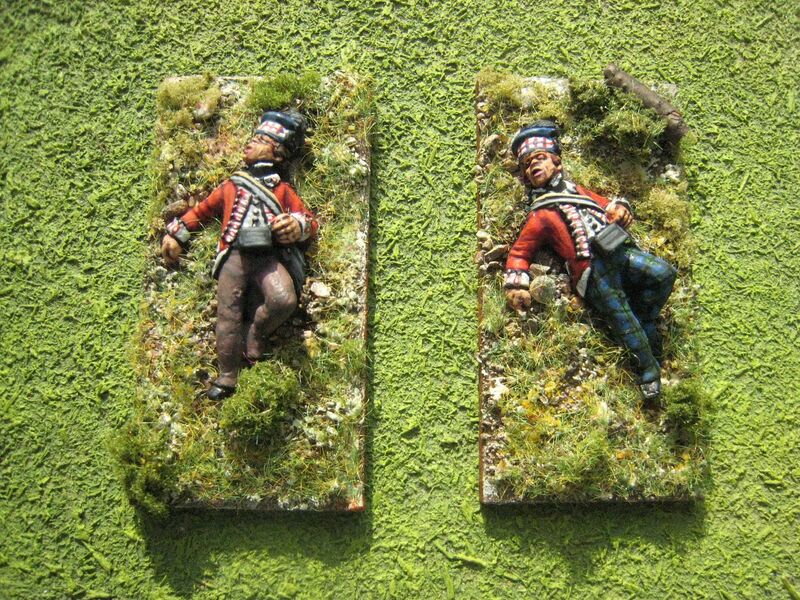 These are painted examples of the prone casualty figure from the King's Mountain Miniatures highlanders range. KMM do 3 highlander casualty figures - 2 standing (although I think one is designed to be advancing/charging) and this dead chap. I have painted 4 for my own collection - 2 from the 71st Foot and 2 from the 76th Foot. 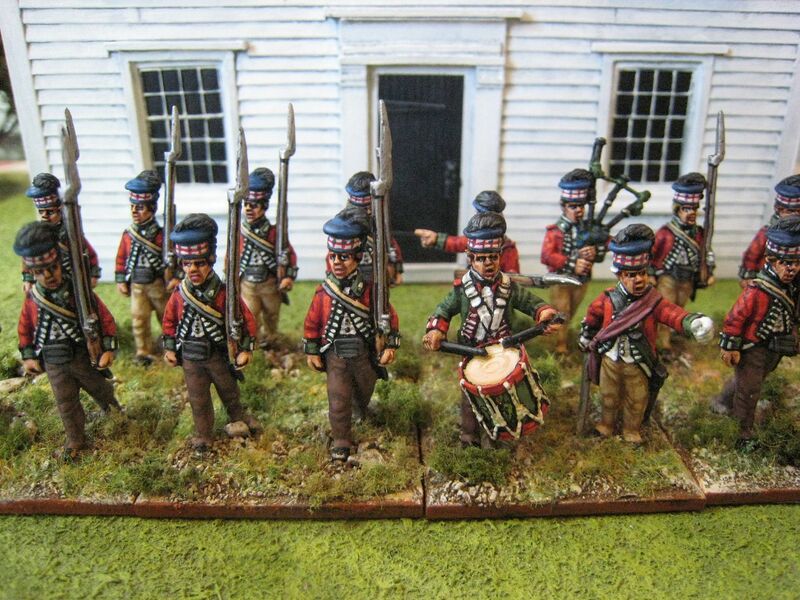 The 42nd Foot in my collection are in full plaid (at the moment - eventually I will do them in overalls and campaign dress as well) so I haven't painted any casualty figures for the Black Watch as yet. 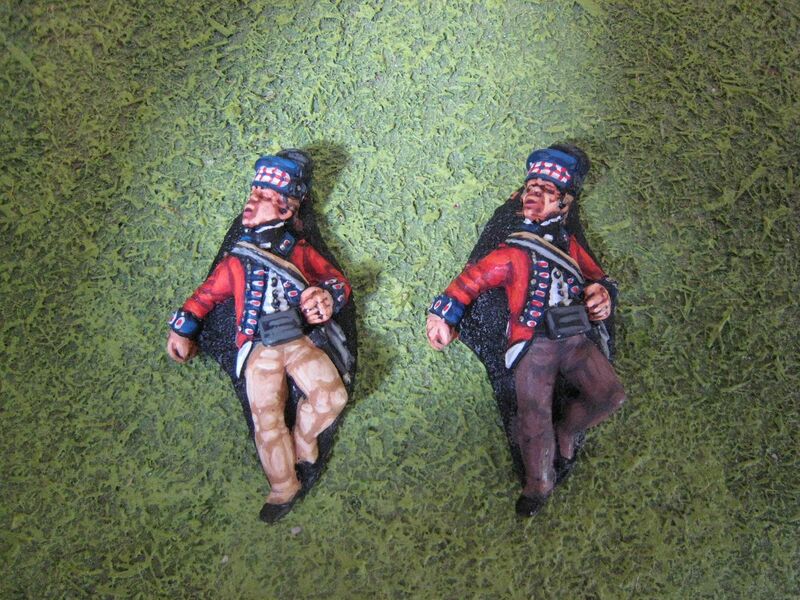 However, below are a couple of these figures that I have painted for Bill as the 42nd. Four figures. Painted May 2014. I'm afraid real life has taken over of late, so please excuse the blog silence. 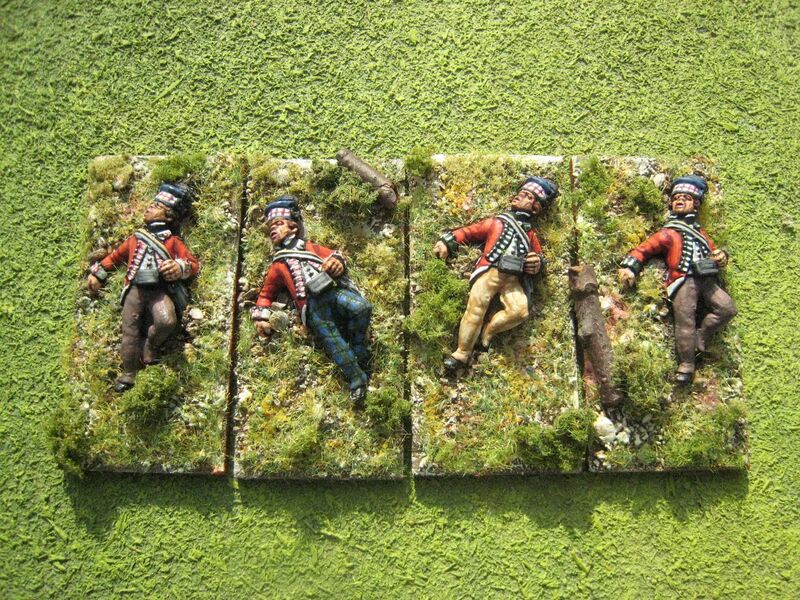 This vignette consists of plastic figures from the Perry Miniatures Continental and British infantry boxes. 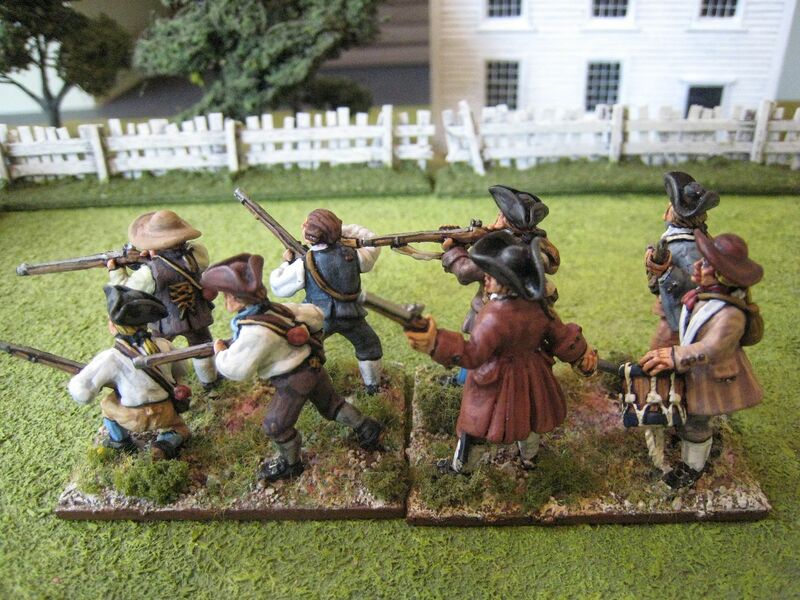 I remember seeing some early photos on the Perry website of figures from the Continental Infantry set before it was released which had an unarmed walking figure. I thought then that a vignette of American prisoners would be worth doing, and here it is. 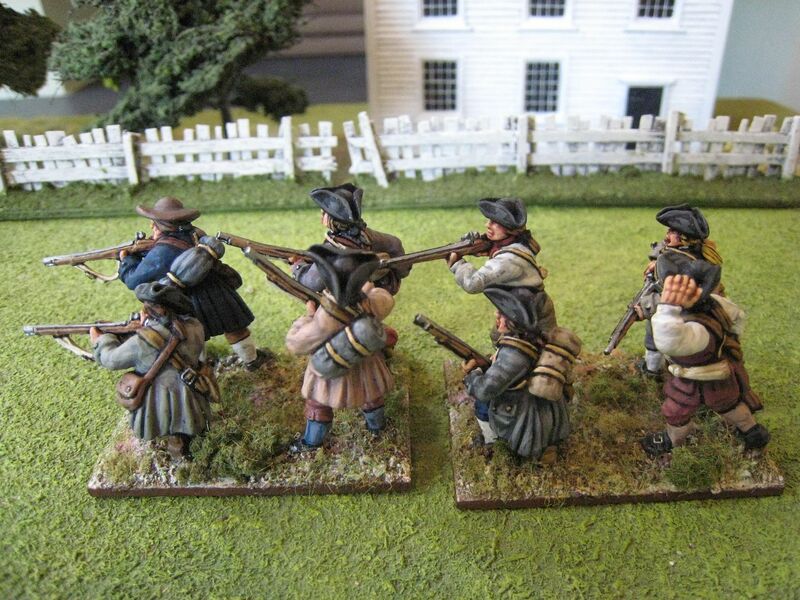 I will post some thoughts on the plastic Continental infantry box set in due course (I'm currently working on the 10th Massachusetts using these figures), so this is more in the way of a taster. 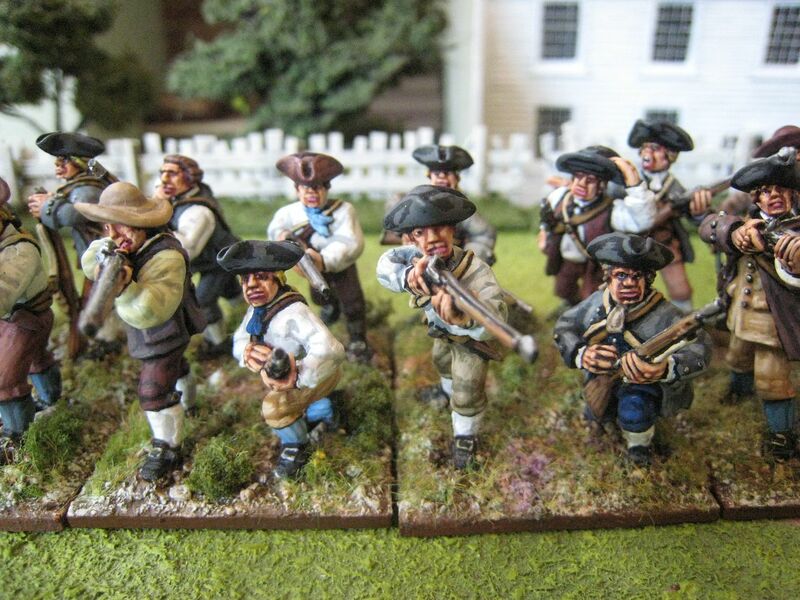 The marching American figures are possible because the Continental set has separate arms and the various options allow you to create figures that aren't carrying anything. I wanted to create a generic scene that could be used for northern and southern battles. The American with the blue coat has buff facings because I thought there was enough red in the vignette already. 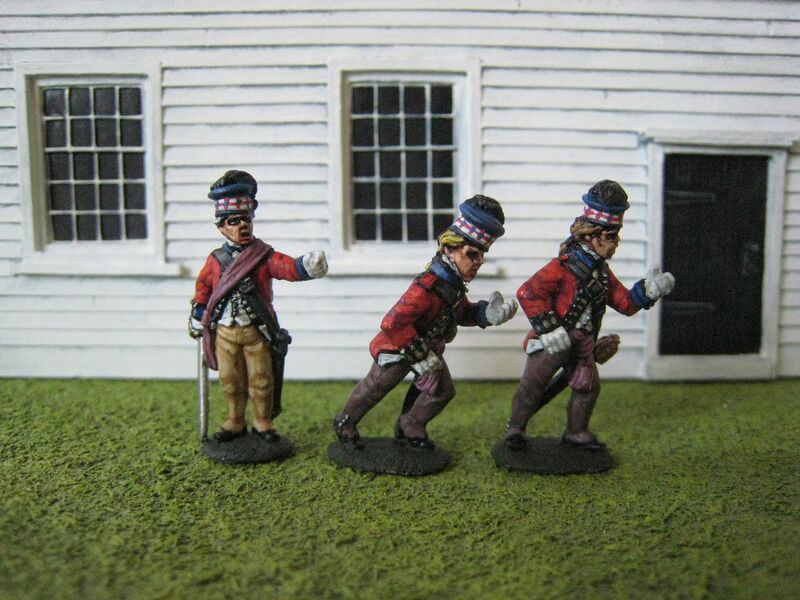 The British soldier has been painted as being from the 5th Foot - not for any special reason, but I wanted a regiment that had a different colour in its facings to buff, blue or red, and the 5th got around a bit during the war. I had originally intended to add some more "battlefield debris" to the scene, but after playing around a bit I decided that less is more and settled for just one loose hat. 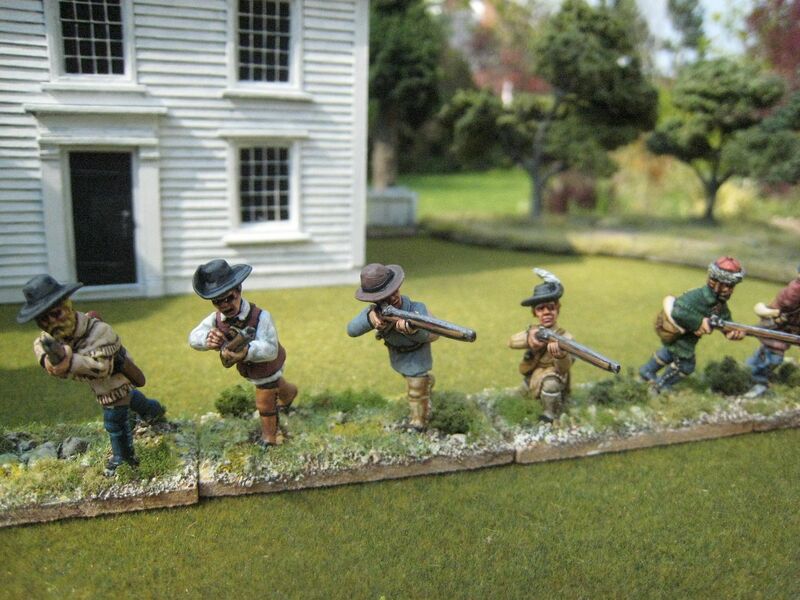 Originally I was going to have a discarded pistol or musket lying in front of the figures, so that the American chap on the left was suggesting that they make a dash to pick it up. But I couldn't really make that work from a compositional perspective. Nonetheless, I'm quite pleased with the way this has turned out, although I'm not really sure how often it will appear on the table. 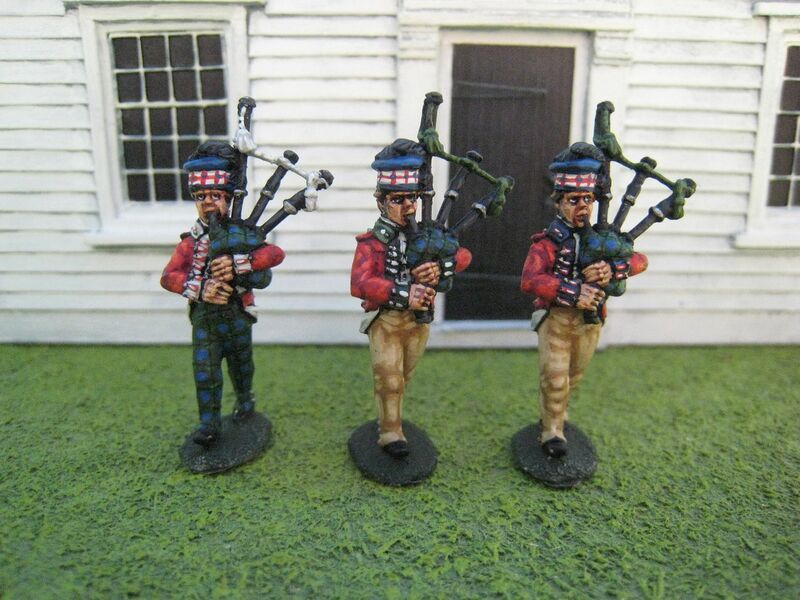 As readers of this blog may recall, I've been painting a large number of King's Mountain Miniatures highlanders for the company's proprietor, Bill Nevins. I've posted photos before of some of those figures as I complete them (which I've taken largely for promotional use by Bill and his agents). 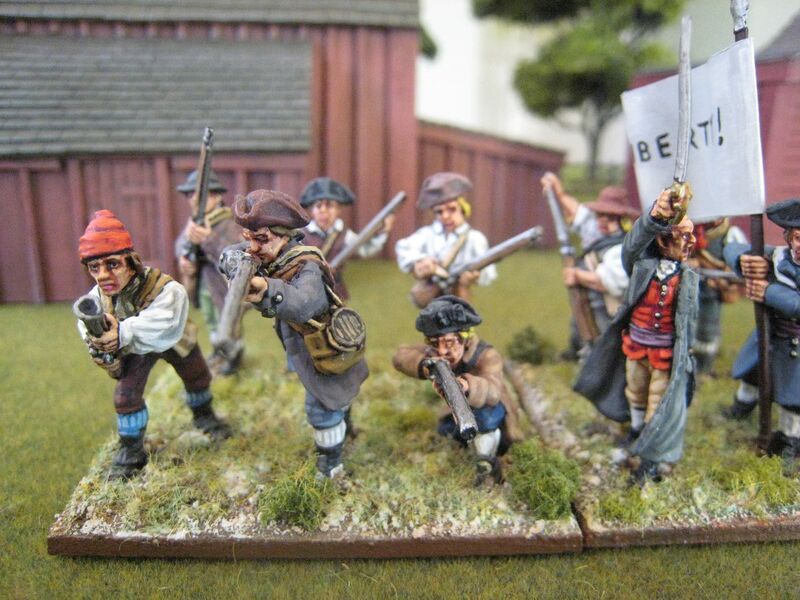 It was while painting more of these figures for Bill over the past couple of months that I began working on the units for myself that are now beginning to arrive from the painting desk. So I thought I might as well post the photos I took recently of some finished command figures. These figures were in the second release of highlanders, I think around October or November last year. These figures will of course appear in the units I'm painting for my own collection, but you might get a better view of the figures themselves in these shots. The highlander units I'm painting for myself are the two "wings" of the 76th and a firing line 71st (I'll shortly re-do my rather crappy earlier post on the 71st Foot to post separately on each of the three units of the 71st that I'll have in my collection). For Bill I'm just painting the 71st and the 42nd. I painted these figures for the 42nd, 71st and 76th at the same time, so you can see the three regiments together in the first couple of photos. The "rules" on musicians' uniforms can be tricky to remember: the drummer of the 42nd doesn't have reversed coat colours because Royal regiments didn't do that and were an exception to the general rule; and the pipers of the 71st and 76th don't have reversed coats because pipers were not official regimental musicians, but rather personal appointees of the colonels, and so didn't wear musicians' coats. The 76th Foot stems from Lord Harcourt's Regiment which was raised in November 1745 and disbanded the following year. The regiment was raised again in 1756 as the 61st Foot and renumbered to the 76th in 1758. After a second disbandment in 1763 the regiment was re-raised in December 1777as the 76th Regiment of Foot (Macdonald's Highlanders) by Colonel John MacDonell of Lochgarry, in the West of Scotland and Western Isles. 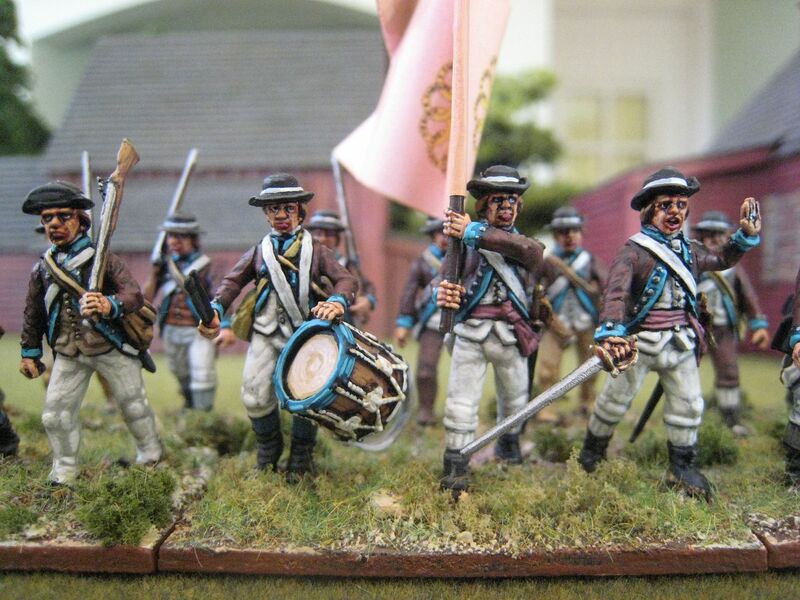 The regiment was disbanded in March 1784 but raised yet again in 1787 for service in India. It's present day successor unit in (what's left of) the British Army is the Yorkshire Regiment. The regiment arrived in America in 1779. The soldiers had initially refused to embark until the arrears of their pay and bounty had been settled. After several days' protest, Lord Macdonald advanced the monies to the troops himself as an investigation had confirmed that the men's grievances were genuine. The regiment was quartered in New York before embarking for Virginia in February 1781 to become part of Cornwallis' ill-fated final American command. The 76th arrived in time to participate in the Battle of Petersburg (or Blandford) on 25 April 1781, in which a force of 2,500 British and Hessian troops under Brigadier General William Phillips bettered a much smaller force of Virginians under von Steuben. 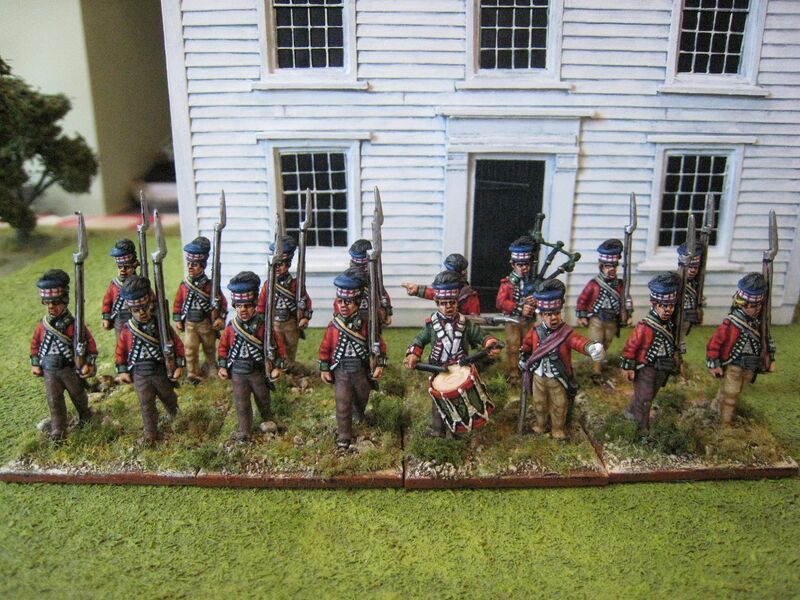 On 6 July the regiment was part of Cornwallis' force that surprised Anthony Wayne at Green Spring. In October the regiment entered captivity when Cornwallis surrendered at Yorktown. I don't know if this regiment was the last British Army unit to arrive in America for the AWI, but it must have been close. 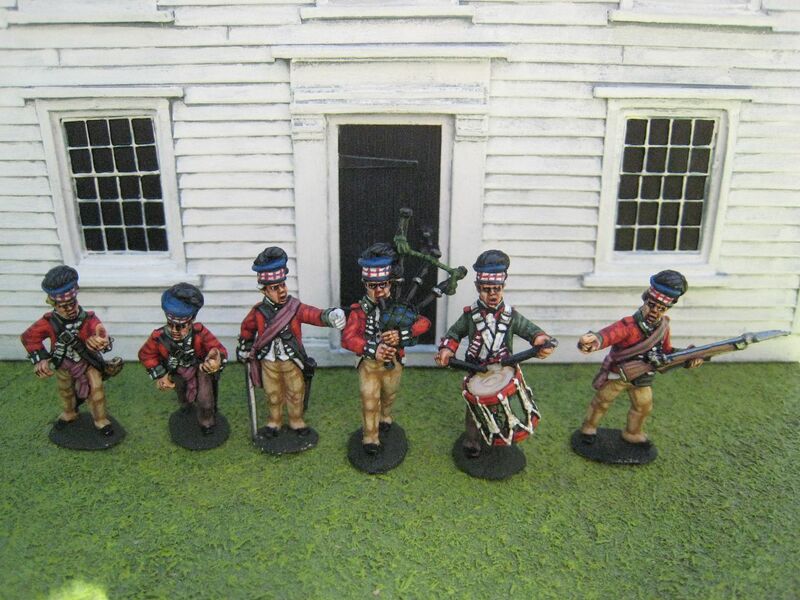 In the published "British Grenadier!" scenario books, the 76th appear in two battles: Petersburg (volume 3) and the hypothetical Gloucester Point (volume 2 - a planner but abandoned British break-out attempt from Yorktown). In the former, the scenario is pitched at a ratio of 1:15 which creates a large unit of 32 figures that is divided into two "wings" of 16 figures each. 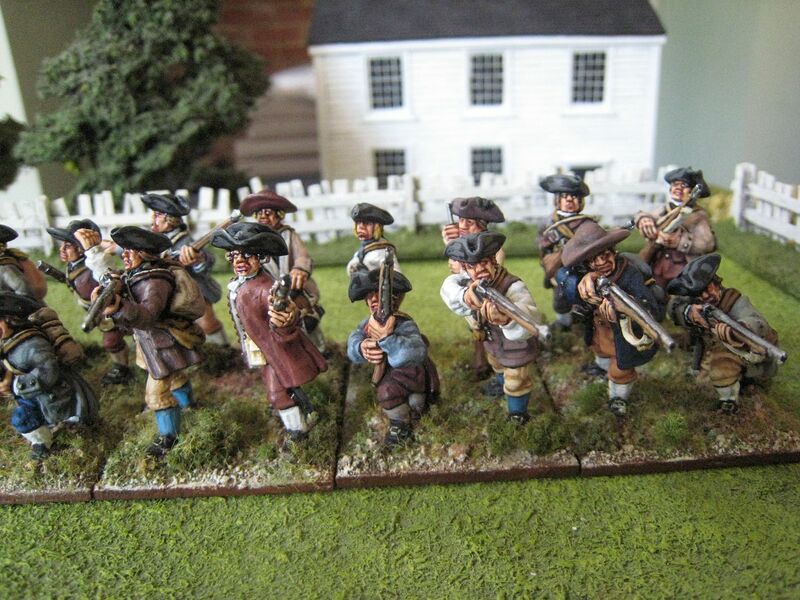 In Goucester Point, there is just one unit of 24 figures. 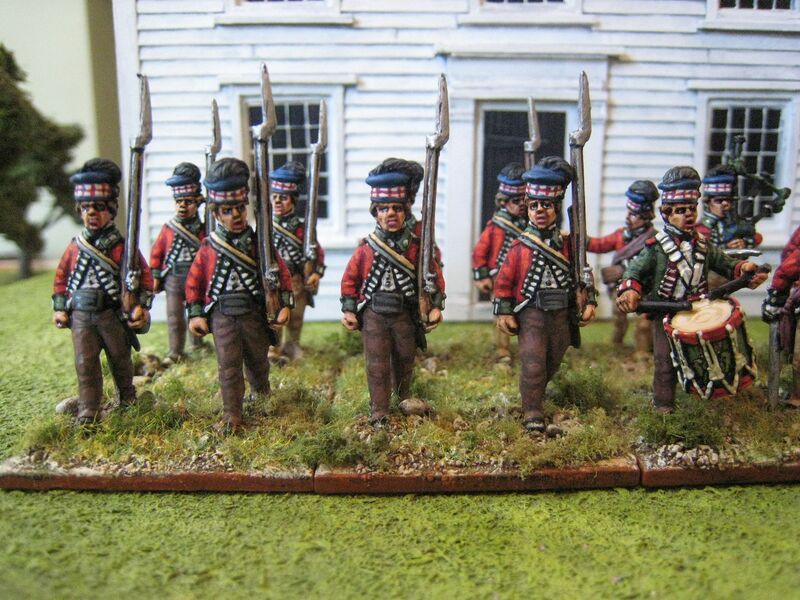 So the way I'm approaching this regiment, using King's Mountain Miniatures figures, is to do one of the Petersburg wings in the marching pose and then a 24-figure unit in the charging pose that will do for the second wing and Gloucester Point. This is the former. The second unit will have the colours, as the ensign figures in the KMM range look to me more suited to the charging pose. The musicians, however, clearly belong in a marching-posed unit and so you see those here. The officer is actually standing, but I think he looks ok here as well. The sergeant behind the drummer is perhaps in more of a "firing line" pose, but I thought he might look as if he's shouting at people to keep in line. I paint all my Southern theatre units in a mixture of overall colours, beiges and browns mostly (and in my AWI collection only the 71st Foot get tartan trews). 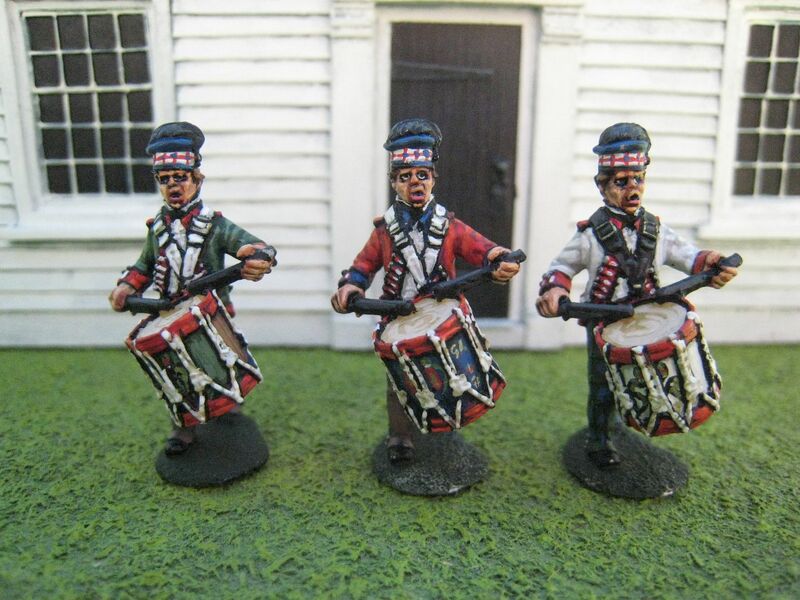 The drummer would probably have a black drum-belt, in keeping with the black accoutrements for highlanders generally, but I thought white was more aesthetically pleasing. The Perries make marching figures in their late war highlander range (which I used for my first two units of the 71st), but these KMM sculpts are worthy of consideration and are pretty similar in size. I was suprised to see that this is my first unit of British regulars in 3 years. 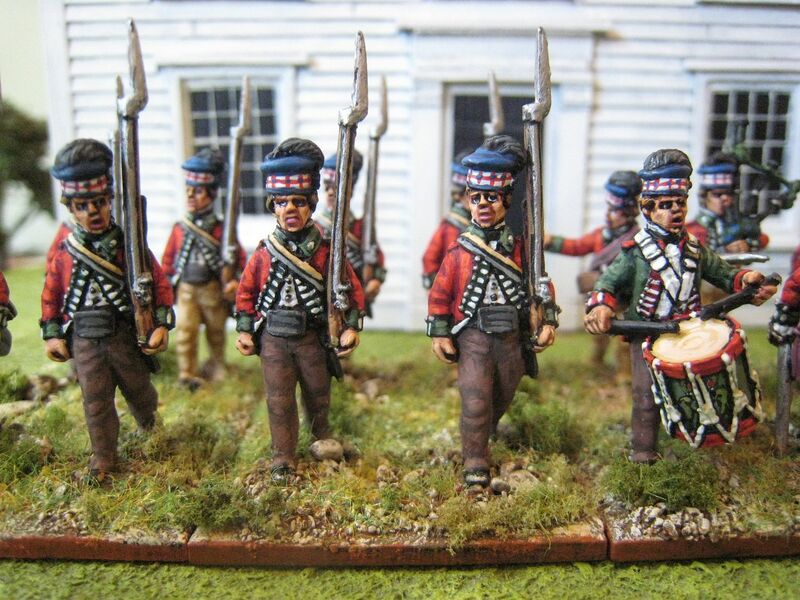 I'm currently working on the larger unit of charging figures and a third unit of 71st highlanders for use in the Stono Ferry scenario, which I suspect will be finished first. 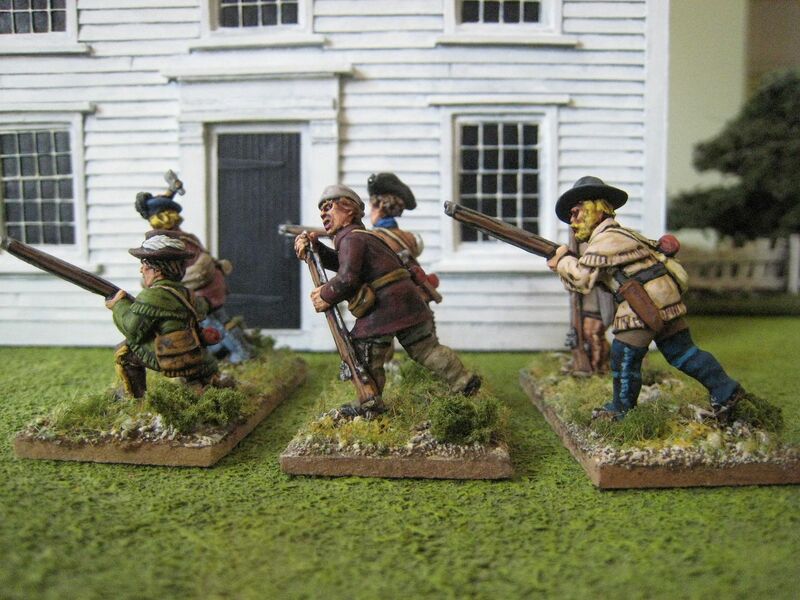 Next up, though, will be a unit of loyalist militia using Galloping Major figures. 16 figures. Painted May to June 2014. Sorry about the further long hiatus on TQ - real life, 2 young children, work, usual reasons etc. I had a total mojo collapse earlier in the year, but that's resolved now and I'm enjoying painting AWI again. 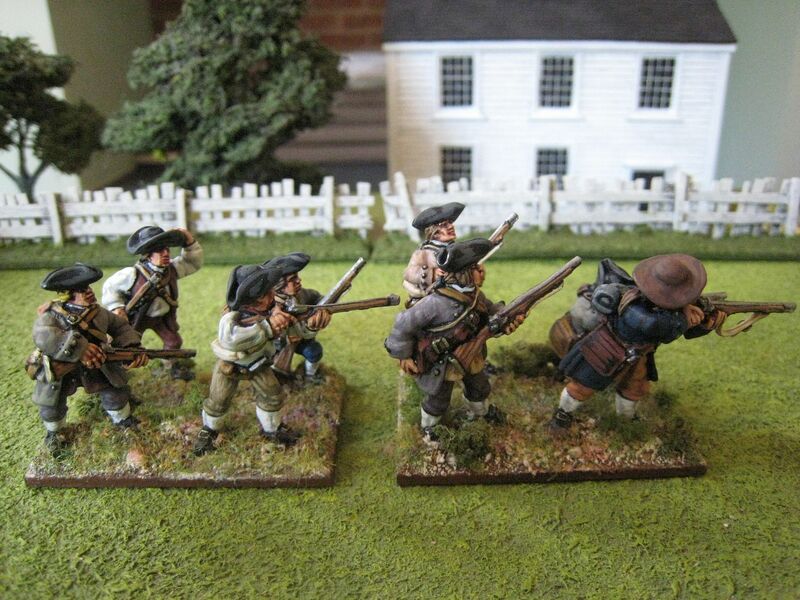 These figures have been a long time posting, and they are of course "over mountain men" ("OMM") from Bill Nevins' King's Mountain Miniatures ("KMM"). These figures were released towards the end of last year subsequent to KMM's very successful AWI highlander range. 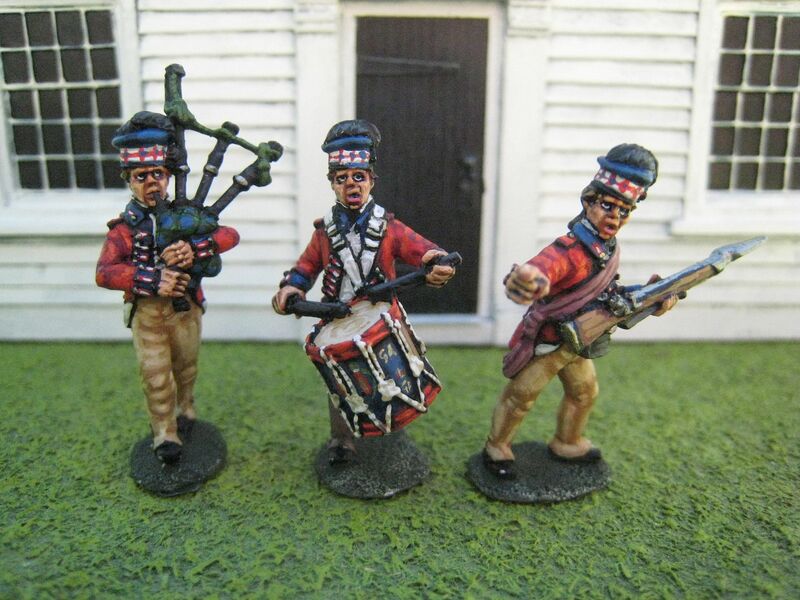 I've been painting lots of the highlanders over the past 12 months, mainly for Bill but latterly also for myself (I found I was getting jealous that I didn't have any of these figures in my own collection!). You can see some earlier posts on these figures here. 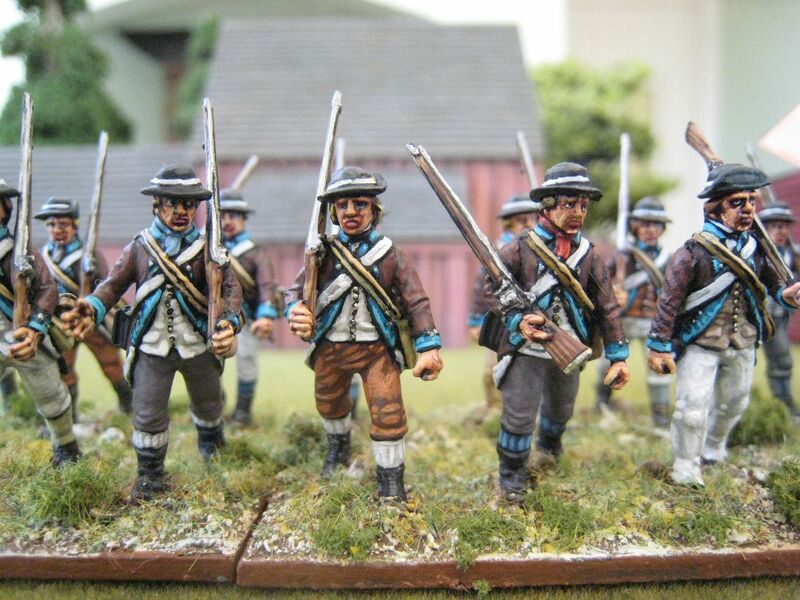 I've recently finished a lot more figures for Bill and a battalion of the 76th Foot for myself and will post on those over the next few days (that's a promise). However, in the meantime here are my first attempts at the OMM. I don't know much about these chaps. I suppose their main claim to AWI fame is the destruction of Major Patrick Ferguson's command at King Mountain on 7 October 1780. The mountains of which they were "over" were the Appalachians and these men were settlers in the areas to the west of those mountains, in what is now northeastern Tennessee and southwestern Virginia. These were areas where the Crown had refused to colonise - the Royal Proclamation of 1763 prohibited settlement west of the Appalachians in recognition of the support that the local Indians had given the Crown in the French and Indian War. That did not deter settlers, who began to crose the Appalachians in the early 1770s and began to create settlements that were essentially illegal. It seems that in the first instances the settlers purchased lands from the local Indian inhabitants, but then in the way of colonisation those settlements quickly increased in size, to the concern of the locals. Conflict soon broke out and in 1776 began what is now called the Cherokee-American Wars, a series of struggles that lasted on and off for almost 20 years. The Cherokee chief at this time was a man called Dragging Canoe, who allied himself with the British during the AWI and appears to have had some role in the capture of Savannah in 1778. The OMM were natural patriots and throughout the AWI skirmished with British loyalists as well as Cherokee along the Appalachian frontier. 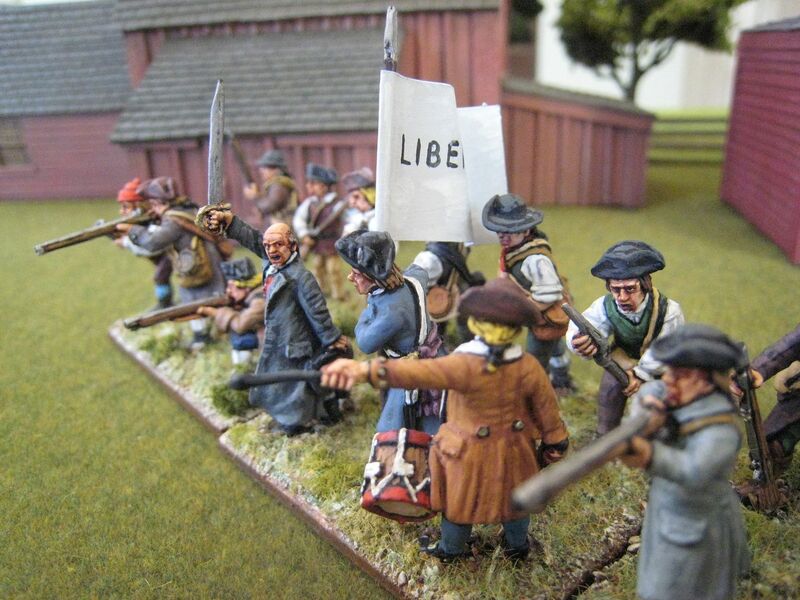 In September 1780 an OMM force of just over 1,000 gathered together in response to a proclamation by Major Ferguson that he would attack their settlements if they did not lay down arms against the Crown. So began a march over the Appalachians that ended with the encirclement and defeat of Ferguson's force of loyalists at the battle of King's Mountain. Most of Ferguson's force of 1,000 were killed or captured while the OMM suffered only 28 killed and 62 wounded. The destruction of Ferguson's force led Cornwallis to abandon his advance into North Carolina. The KMM range has 16 figures in various poses that take separate heads from a vast selection. I haven't yet counted the number of different heads, but there are about 30 sets of varying headgear. Those sets include things like jockey caps and dragoon helmets which you wouldn't use for OMM but are instead designed for KMM's forthcoming Continental figures. So for the OMM you have instead lots of bearded heads with hats, caps, bonnets, bandanas etc which create a very distinct look. Some heads suit some bodies better than others, so you need to experiment a bit before you find the best fits. But these are very useful figures than can be adapted for all kinds of things. 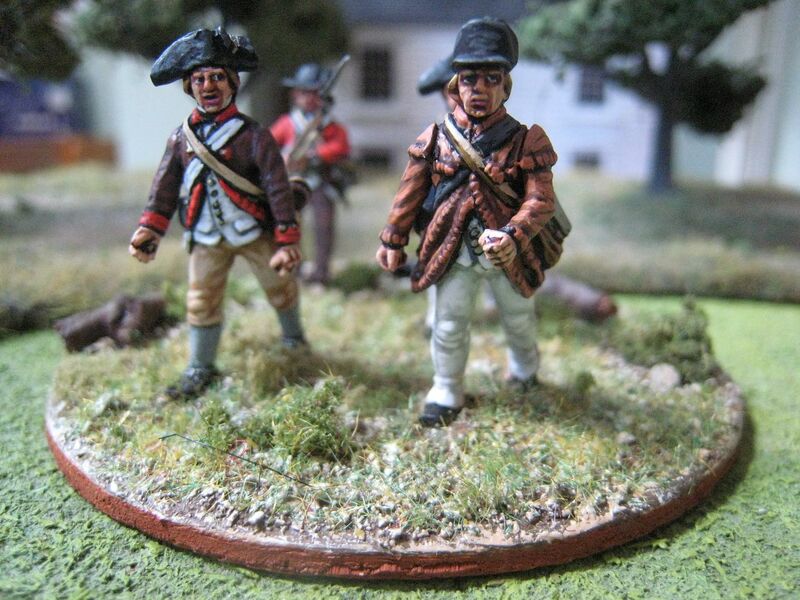 I have built a first unit of 12 figures, based in pairs on standard "British Grenadier!" 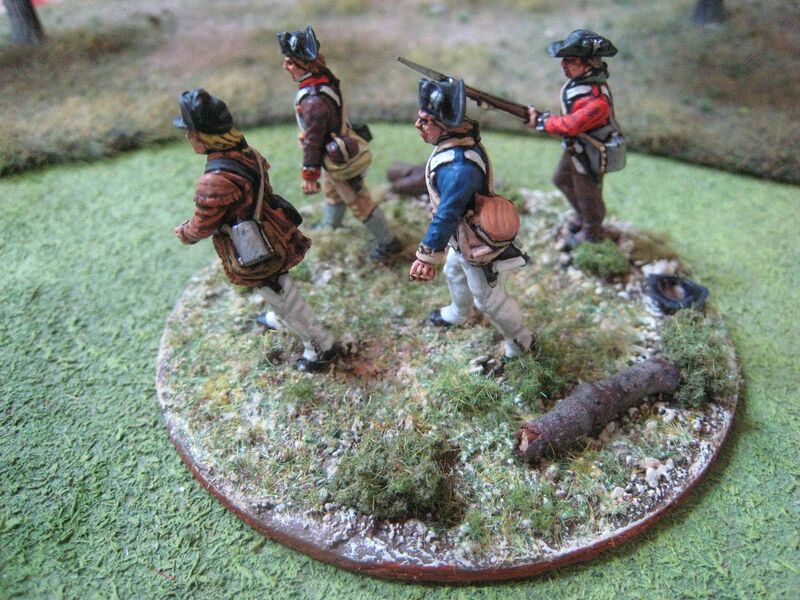 skirmish bases. 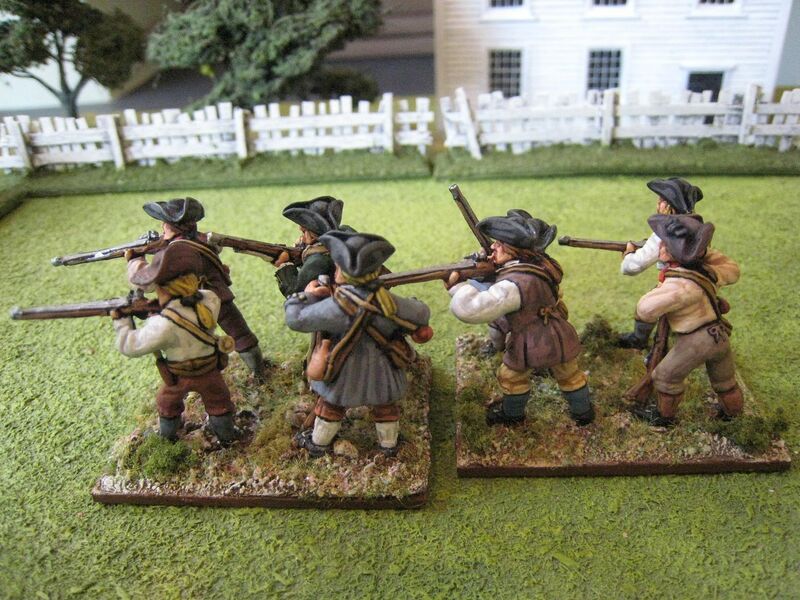 As well as using these figures for the OMM themselves, I have in mind a more generic frontier militia unit which I would use for Guilford Courthouse and other southern battles. I tried to keep the colours fairly muted, although I allowed myself a bit or artistic licence to introduce some colour onto the leggings. 12 figures. Painted December 2013 to February 2014.